This is a picture of our sweet Trinitie Faith. She was delivered on Tuesday, March 23, 2012 at 23 weeks gestation. I had had blood pressure issues and was on bed rest for several weeks before her delivery and subsequent loss. Also, my husband’s father had passed away after a short illness two days prior to her death. Life was in a fog for several weeks, but God placed precious friends and family to help us walk through this dark time. Additionally, caring folks like Regina Binz of Holy Sews went out of their way to empathize and express their condolences. Regina contacted me through a mutual friend and learned that this was actually our third miscarriage. The second and third years of our marriage were plagued with the loss of babies at 20 weeks gestation. The first time it was just passed off as a fluke and after two different days of induction, baby Gabriel was delivered vaginally and no formal acknowledgement was made of his passing. In the second pregnancy my body went into full toxemia (HELLP syndrome), and my life was very much at risk when stillborn Michael was delivered by c-section. The hospital gave us pictures of Michael in a tiny cap with gown, but once again we did not do a formal burial. Many medical tests followed and I was diagnosed as having lupus. We were told if there were further pregnancies we should pursue shots to thin my blood for proper clotting. The fourth year of our marriage, at the age of 33, I delivered a healthy baby girl born via VBAC. Every two years for eight years thereafter we were blessed again. We have five children, four girls with one big boy situated right in the middle. At the fifth birth I was 42 years old. Over the next 5years I experienced what I thought were probably early-on miscarriages (6-8 weeks) and l imagined the “old body” was done with birthing. I truly was grateful for our children, but I always wondered “what if God would choose to bless in that area again. At age 48 my “what if came true. But at 20weeks, high blood pressure was once again a serious issue. At 23 weeks the doctors told us the baby should be delivered because she was not thriving in the womb with the restricted blood vessels. Also, I was very ill. It was a very disturbing decision, but a c-section was done and baby Trinitie lived for just 12 hours. I only saw the baby briefly in an incubator just after surgery. I was very groggy from the medication. She was quickly transported to a neighboring hospital with an NICU. My husband was able to be with her, talk to her and touch her little hand for brief bonding. We were given a Holy Sews pink blanket ensemble for Trinitie’s burial. As you can see from the pictures, she was embalmed and then beautifully wrapped in those sweet little blankets and tunic. The funeral home graciously processed the body for us at no cost and allowed our family the use of their facility for our last viewing and holding the baby. “Now I Lay Me Down to Sleep” photography ministry to grieving families took pictures for us before her small funeral service at a Babyland cemetery. Just weeks after our loss, Regina was visiting family in our part of the state and wanted to meet to give me a second set of our blanket ensemble as a memorial to Trinitie. When we met, she was so gentile and thoughtful as she had been on the phone during our first conversation. She brought with her a special, unexpected gift. Since this was our third loss, Regina brought not only a matching ensemble to Trinitie’s, but also a beautiful commemorative blanket, which she had made and embroidered with all three of the babies’ names and dates of birth. She truly has a heart for the hurting. 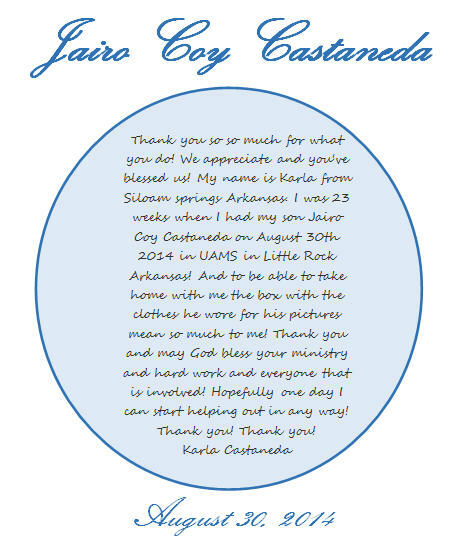 Our lives have been so blessed by the ministry that she envisioned and oversees. “Thank you” just doesn’t seem to say enough for the kindness we’ve been shown. May God bless all those involved in making this ministry possible. You guys are amazing! We were so unprepared when we went to UAMS to have our angel 5 years ago and it was such a relief to see the tiny layette waiting for him. Thanking you so much for all you do! The longest day of my life that lasted about a week. April 27, 2007. Kevin, Torrie and I had gone to our OB appointment to see an ultrasound of our baby and after a tense and quiet moment, I forced the news out of the tech, our baby boy had no heartbeat. I understood at that moment what the phrase meant, My blood ran cold. I felt it all over my body. Then I went numb. In fact, I built a bubble around me and I stayed in it. It was a self defense mechanism, a coping strategy, a desperate attempt to hold on to sanity. I was admitted to the hospital the next morning and for two days I laid there, in my own little world, waiting for the pitosin to do its job. Protecting and distancing me with my bubble –in spite of the fact that family, friends and nurses were coming and going as if nothing was wrong. 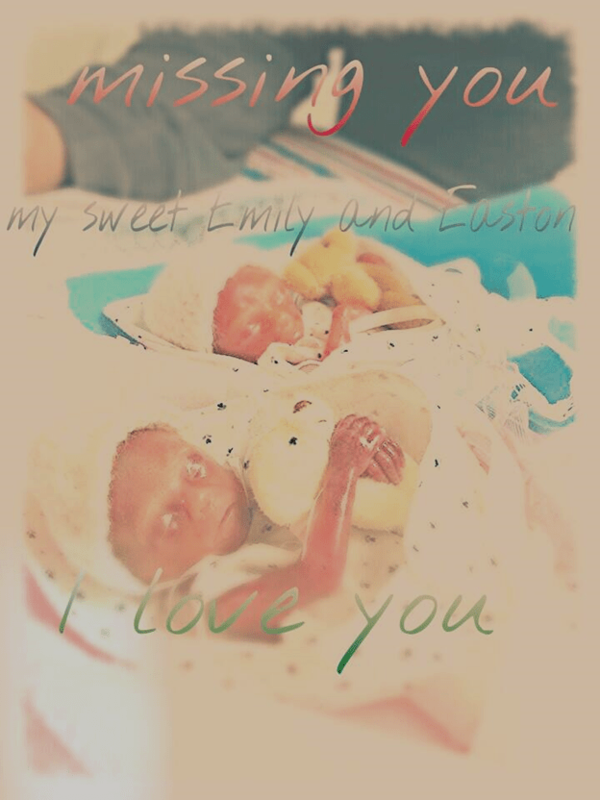 Here are my sweet angels, Emily and Easton, holding their little bears that UAMS gave them after I had them December 29, 2013. Some may say I shouldn’t share pics of my babies with others. The way I see it is they were so beautiful and the volunteers who took the time for my angels helped us with clothing them and it touches my heart to have such good pics of them dressed nicely. You all made them look so handsome and pretty. Again thank you all very much from me and Steve. They were in our arms only a short time but live in our hearts forever. The bereavement team here at Crouse Hospital in Syracuse, NY, would like to say thank you for the beautiful baby items that I received today. 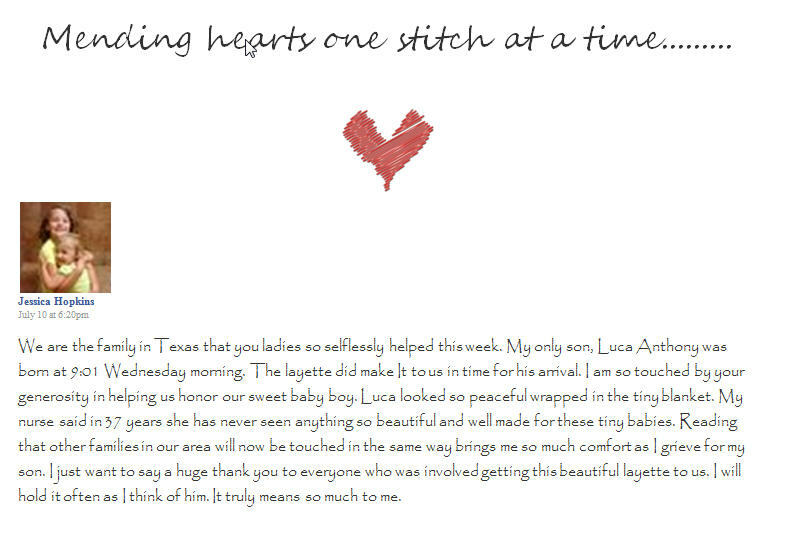 Our families that experience a loss of their baby will absolutely love them. I can tell a great deal of time and love was put into each and every one of the outfits. You do beautiful work. These should keep me for a while, and I will contact you when I need additional outfits.